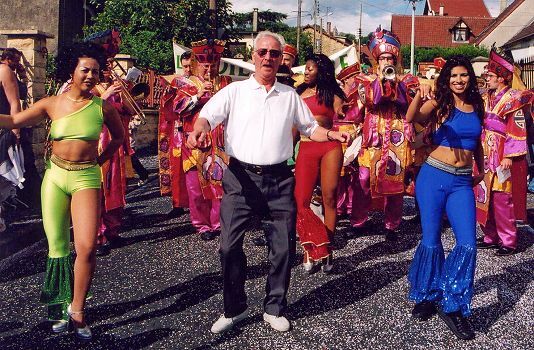 The year 2002 is the 20th anniversary of the signing of the twinning agreement with Crosne. 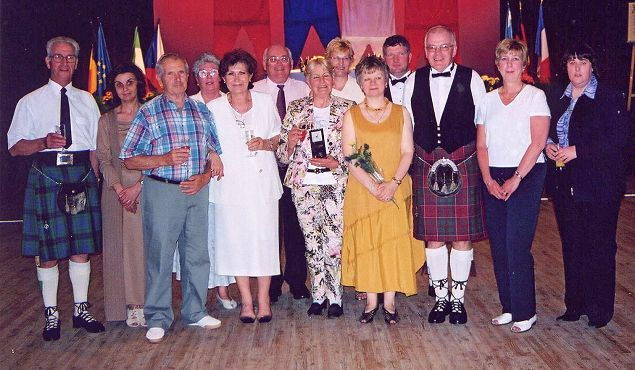 Maybole twinners were in Crosne May 17th through the 20th to celebrate this occasion. Click on the images below to view them full size. 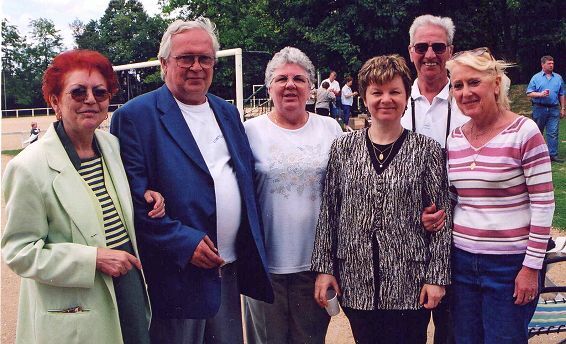 See images from the first visit 20 years ago here. Twinners take time out from their picnic for a group photo. that he really is a true Scotsman! Happy Birthday – we love you! That was the message to Maybole town twinners who travelled to France to mark their 20 year connection. The celebrations began on Friday evening May 17 with a parade from Rue de Maybole led by two members of Paris & District Pipe Band. 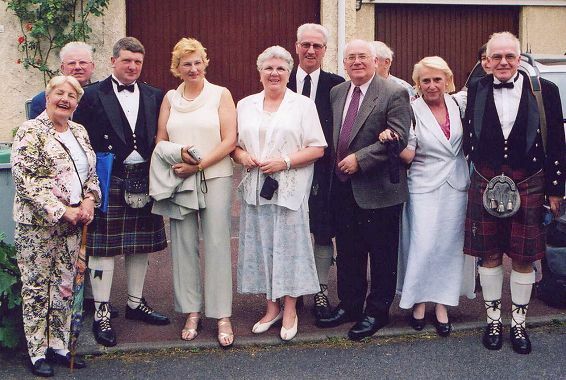 They had been hired by the French hosts as no one from Maybole Pipe Band was able to make the trip. The Scottish group were welcomed by Genevieve Rochereau, Mayor of Crosne, and Marie-Christine, President of Crosne’s Town Twinning Committee. Following this there were congratulations from delegates from Schotten, Germany; Rymarov, Cheq Republic; Arco, Italy; and Beloeil, Belgium; towns also twinned or specially linked to Maybole and Crosne. In his speech, William Grant, chairman of Maybole Town Twinning Association, said, “To be standing here today is a special honour for me - 20 years have now passed since the twinning ceremony between Maybole and Crosne took place, and since this beginning all those years ago, strangers have become close friends, and through this friendship we have watched our families grow and our friendships flourish. Sadly, some old friends have passed away, and are sadly missed. The speeches were followed by a meal and great entertainment from a jazz band and a sequence dance group. Also in the group were Hugh Anderson, Town Twinning vice chairman, and his wife Sally; Maureen Craig, secretary; Margaret and Alex Davidson; Andy and Ann McDowall; Lesley Grant; Jim Sym; and David Kiltie, chairman of Maybole Community Council. Over the rest of the weekend the visitors enjoyed a day in Paris and a boat trip on the River Seine; a torchlight procession in Crosne and the French town’s Pentecost carnival. 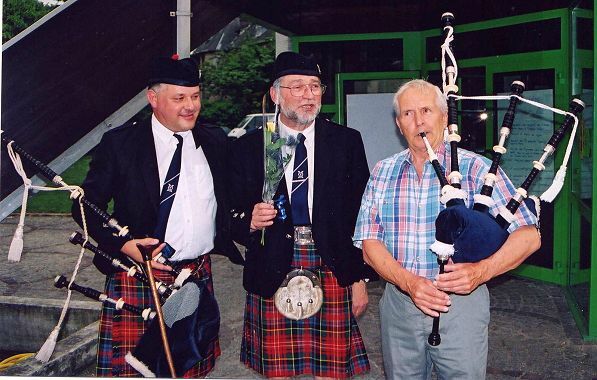 It was Mr Berson and Mr Kiltie who signed the original twinning documents in 1982.